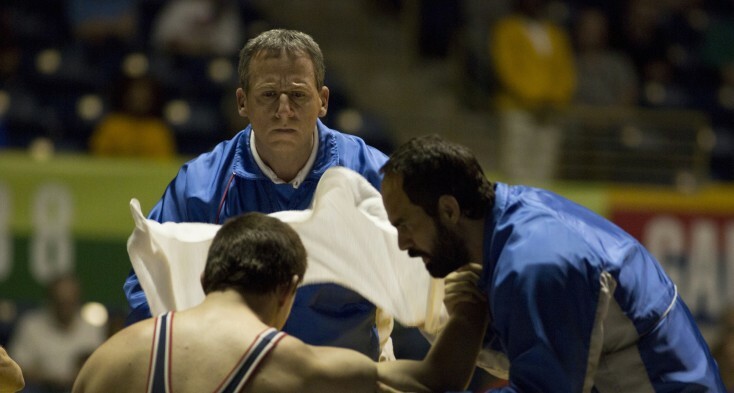 The drama centers on the bizarre relationship between chemical company heir John du Pont (an almost unrecognizable Carell) and wrestling’s Olympic gold medalist Mark Schultz (Tatum). The millionaire invites Mark to live and train with other wrestlers he has assembled at his Pennsylvania estate after the athlete has fallen on hard times following his success at the 1984 Olympics. Single and nearly friendless, except for his older brother, Dave, also a champion wrestler, Mark agrees to go. 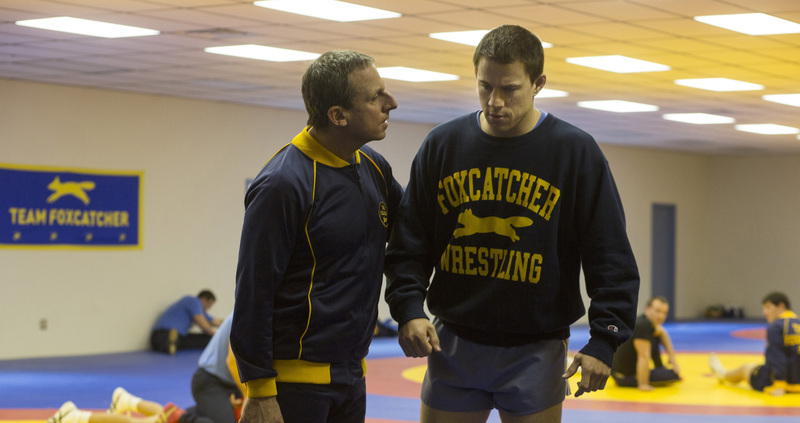 Once he arrives at sprawling Foxcatcher Farm, du Pont appoints himself head coach of his team of wrestlers, eager to win the respect of his peers and the approval of his cold and distant mother (Vanessa Redgrave). Q: Channing, it looks like you took some hard hits in this movie. What was that like? Tatum: The hard hits I don’t think they’ll ever leave my body. You can’t fake wrestling. We learned very quickly you can fake a punch on camera but with wrestling you just have to go ahead and do it. You need to see the hand, the face and the head butting. It was the hardest thing I’ve every done, physically. I’ve done a lot of sports, a lot of martial arts. It was a suffocating and painful thing but I’ve got to say, I’m so in awe of those athletes and proud to have been given the time and focus. They were some of the most amazing athletes I’ve moved with. It was a blessing. Q: How was it working with Steve Carell and Mark Ruffalo, what did you admire about them? Can you talk about working with them? Carell: He picked me up like I was a sack of sugar. He laid me gently down on the mat. Q: What struck me about both of you was the way you carry yourself. Channing, when you walk, you have a very specific lumbering walk. And Steve, you movements reminded me of how a very rich person moves. Carell: So all “old money” people move like that? Q: It reminded me of someone I knew. Did either of you work with a movement coach? Tatum: I got to hang out with Mark a lot so I just copied the way he moves. I didn’t have an actor reason. That was just him. The way he held his fork, he was like a very dangerous animal and he moved through life in that way. He wanted people to be afraid of him. Carell: There was tape on du Pont, and I watched as much as I could. Q: Can you talk about getting into this character’s mindset and understand John’s motivations? Carell: I thought about how sad a person he was. His parents divorced when he was 2. He grew up in this enormous house, essentially just he and his mother, who, by all accounts, was a pretty chilly person. So, I thought a lot about that—who he was growing up and surrounded and insulated by wealth. I think he was lonely and in need of things that he didn’t have the tools to acquire. That helped me along the way. That was what I thought about. He was somebody that was in need of assistance. He was somebody that didn’t have a circle of friends; he had a circle of employees. No one was going to intervene. He didn’t have anyone who was there to see the red flags, and that’s incredibly sad and tragic to me. I never approached him as a villain. I thought of him in that other way. Q: You go to some dark places. How did you come out of that? Did you do that daily? Or was it at the end of the shoot? Carell: (laughing) I don’t know about (Tatum) but it was all pretty dark. A lot of it was because Bennett sets the tone and it’s not a light, lively, effervescent place to be. But I think that was important. Everyone took it very seriously. What added to that were the people that were there. Mark was there and Dave’s widow was there for a time. They were very generous and we felt a responsibility to them and to be as honest as we could to the story and to stay in it. It wasn’t fun. Tatum: I can’t say it any better than that. We all came in with the intention of going on this ride with Bennett. He would say, “jump,” and we’d say, “How high? Or how low?” and we just stayed in it. Q: Mr. Carell, how has your career changed since you took on this role? Carell: You get to work with somebody like Bennett and you work with actors like Channing and Mark, and it’s a different experience. The change for me is that I want to do more of this. It was challenging and exciting and exhilarating and I felt like it meant something. In terms of so much of the response that the film is getting, it’s very rewarding that it’s resonating with people. I never know if I’ll ever do anything on this level again but I would aspire to because it’s been a great feeling. Tatum: They’re all different muscles. Comedy doesn’t come easy to me. I’ve only done two movies that were comedies and I had to work at them. They’re just as scary in a way. I hate labeling movies as “comedies,” “love stories,” “dark dramas.” They’re all just different muscles. I’ve only played one other person that was real before. The stakes are very high. I have to live with Mark Schultz in the world and hope I did some amount of justice for him. Hopefully, some of the things are more tangible and they’re not just in some high-stakes, make-believe game that movies are. I enjoy going deeper than I’ve ever gone into a character before. I can’t say that I want to do this forever. I think I’ll just find the people I want to do them with and then go do them. Q: Is this a performance you knew you had in you? Carell: (deadpan) Oh yeah, I’m very dark inside. I didn’t question it. It’s not a part I campaigned for. Had I only read the script, I don’t think I would have gotten in touch with Bennett to say, “I need to throw my hat into the ring.” At the same time, when Bennett called me in and we discussed it, I trusted him. The fact that he thought I was capable of doing it allowed me to believe the same. Q: What kind of personal satisfaction or fulfillment do you get in playing a real person? Tatum: It’s the journey you get to go on with the people you’re doing it with is part of it. You are playing someone else but ultimately they’re versions of the person, because you have to go do them. I can’t do everything that Mark Schultz is in a 90-minute movie. It doesn’t work like that. I’m really telling Bennett’s story. I tried to be as honest as I could be on the walk and kept digging every day. I don’t think we every had a day where we left and felt, “Oh we crushed that scene.” You just don’t. In a movie like this, we said, “All right, I think we got the scene.” It is precious and you keep digging. The satisfaction came when it was over and I knew that I left it all out there. I gave all the colors I could possibly give so Bennett could paint his picture. Q: Has Mark Schultz seen the movie? Tatum: He has, a few times. Q: Have you spoken with him since you wrapped?